It’s time to start thinking about Passover. (I know — ugh!) With less than three weeks left, those of you who observe this annual frenzy of cleaning and eating are probably planning your seder menus. 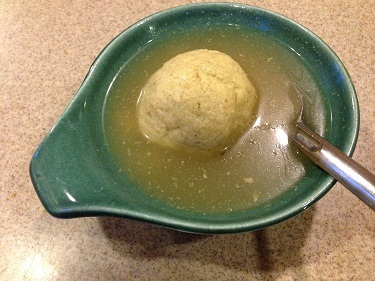 For almost everyone, matzoh ball soup will be featured prominently. In case anyone out there doesn’t already have the perfect matzoh ball recipe, I thought I’d tell you how I do it. But first of all a caveat: I can give you instructions, but getting a perfect matzoh ball is almost more a matter of intuition than a recipe. Ask my daughter; she followed my recipe a few times with disastrous results, because she didn’t yet have the “feel” for it. The secret is to make the matzoh ball mix just firm enough. Too soft, and your matzoh balls will fall apart. Too hard, and your matzoh balls will bounce. (Of course some people like them chewy. Me, I like them so fluffy that they seem to melt in your mouth.) Because of the size of the eggs, or because some of us don’t measure exactly, the mixture can be different from time to time. After you mix the matzoh meal into the egg mixture, it should feel firm but loose — not soupy, and not hard to stir. If it seems too loose, add a sprinkle more of matzoh meal. Too firm, add a teaspoon or so more water or broth. After you’ve made matzoh balls a few times, you’ll know what this mix should feel like, and your matzoh balls will be perfect every time. The best matzoh balls are made with rendered chicken fat (schmaltz). But how many of us cook with chicken fat any more? I used to use fake chicken fat called Nyafat that you could buy in the grocery store, but they stopped making it a few years ago. I’ve seen recipes with oil, which I think is too liquidy. You can use margarine, which is what I do at Passover, though during the year I prefer to use solid vegetable shortening, which has the same consistency, if not the flavor, of chicken fat. I like large matzoh balls and serve one per person. If you prefer, you can make them smaller and give everyone two. This recipe makes eight large matzoh balls. It can easily be halved if there are just a few of you or doubled to serve 16. Beat the eggs and then beat in the fat, the chicken soup or water and the salt. Sprinkle in the matzoh meal and the chopped parsley if you use it, and stir quickly with a fork so that there are no lumps. Add a sprinkle more matzoh meal if the mixture seems too loose. Place plastic wrap on the surface of the matzoh and press down to remove air. Refrigerate for at least 20 minutes, and up to a few hours. Fill a large saucepan (a Dutch oven is good) with water and heat to boiling. Wet your hands and form round balls with the matzoh meal mixture. You can drop them in the boiling water as you make them, or place them on a plate or board until you’ve made them all to assure a uniform size. Put the balls in the boiling water. Within a minute or two, they should float to the top. If any balls stick to the bottom of the pot, give them a little nudge with a wooden spoon to loosen them. When the water returns to a boil, reduce heat to low and cover the pot loosely. If you use packaged coleslaw mix, this recipe is very easy. I don’t like gloppy coleslaw and so I made one recipe of dressing stretch for a whole cabbage, shredded – the equivalent of two bags of coleslaw mix – and it worked very well. If there’s carrot in your packaged coleslaw mix, you can eliminate the grated carrot, but do add the scallions. You might want to add a little more than a dash of red pepper flakes – maybe ¼ to ½ tsp. – to give it a little extra zip. If you don’t want to make a lot of coleslaw, use half the dressing ingredients, or make the full amount and save half for another time. It should last several weeks in the fridge. In a small saucepan, combine the crushed pineapple with juice, salt, red pepper flakes, ginger, vinegar, sugar and cornstarch. Whisk together until cornstarch is dissolved. Bring to boil over medium-high heat, stirring constantly. Cook until dressing is thickened, 3 to 5 minutes. Cool to room temperature. 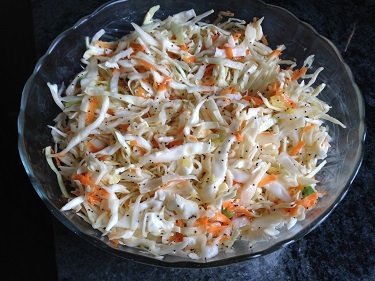 Place shredded cabbage, scallions, carrot and poppy seeds in a large bowl. Stir mayonnaise into the cooled dressing mixture. Add dressing to the vegetables, and toss well to coat. This was adapted from a recipe by Kate Lawson that originally appeared in the Detroit News. Combine seasoning with sugar and salt and rub over surface of fillets. Roast for 10 minutes. Blend the marmalade and lime juice. Remove the fish from the oven and brush with the glaze. 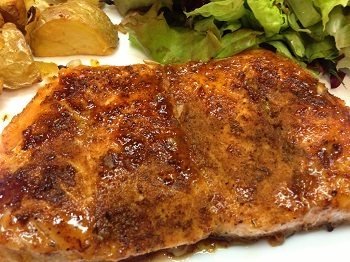 Return to the oven and cook another 2 to 5 minutes, until salmon flakes easily with a fork. Serve with lime wedges.